FSB EA export and MT4 backtest problem? Forex Forum → Help and Support → FSB EA export and MT4 backtest problem? Topic: FSB EA export and MT4 backtest problem? It’s been a while. I trust everyone is keeping well. I have checked the Forum Help and Stickies and searched - and find nothing relevant re. the problem described below. I spent some time to run the tests and document the problem if it may be helpful. Please refresh my memory if this is a known and unresolved problem? Please see the attached .zip file including a Word doc - with the text below but including screenshots; also the test EAs and export files - from FSB and from MetaEditor. Problem: EAs constructed in FSB and exported from FSB do not backtest in MT4 - while all other EAs backtest in MT4 OK at 90% modelling Quality using ‘Every tick’ data (or using ‘Open prices’). - The ‘workaround’ I discovered - of compiling the FSB EA in MetaEditor allows the FSB EA to run an MT4 backtest but using ‘Open prices’ only, but it will not run using ‘Every tick’. - The reason for trying to backtest FSB EAs in MT4 was just for the reassurance that the results somewhat validate those in FSB before spending time running live forward tests. Also to then try optimizing FSB EAs in MT4 out of curiosity if the results may be interesting or useful. Constructed a test EA in FSB, exported it from FSB and attempted to run a backtest in MT4 on ‘Every tick’ using 5 Minute timeframe data. The MT4 Journal displays the entries in the screenshot below. Note: I have broker data (all timeframes) from May 2015 - and specify ‘Use date’ from 2016 05 20 - to ensure it is not an ‘insufficient data for indicators used’ error. Note: the unmatched data errors do not affect EAs not constructed in or exported from FSB. - EAs not constructed in FSB routinely run backtests OK on ‘Every tick’ with 89-90% ‘Modelling quality’ in the backtest report. The FSB test EA backtest does not generate any trades for many minutes. 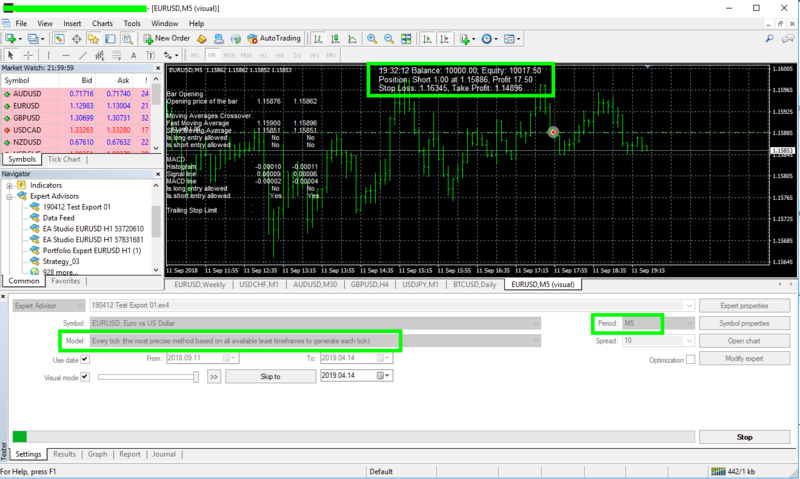 The backtest runs completely within 1 minute (green completion bar) but generates no trades and Journal shows no errors. Next in FSB I ‘Save strategy as Expert Advisor’. I open and compile the FSB EA in MetaEditor - with no compile errors; quit and restart Metatrader 4 and try to run a backtest of this version on ‘every tick’ on 5 minute data from the same Start Date as previously described. After some minutes with no trades or progress I stop the backtest. Next I quit and restart MT4 and run the FSB EA compiled in MetaEditor using ‘Opening prices’. - It quickly successfully completes the backtest with similar Report trade statistics to those shown in FSB. As a process of elimination - to show this is not an MT4 problem - without restarting MT4, I run a backtest of a ‘hand-written’ extremely complex EA (multiple entry and exit indicators etc) on ‘Every tick’ from the same start date on the same 5 minute data. After some minutes the backtest completes successfully with the Report showing 90% Modelling Quality. Re: FSB EA export and MT4 backtest problem? I run the attached expert on MT4 M5 Every Tick and it trades normally. Thanks for testing and confirming it appears to be a local problem for some odd reason; and apparently not cause for concern. I now see I can replicate your result on Alpari data but not on my broker's data for whatever reason. Thanks for your great support, as always it's much appreciated.